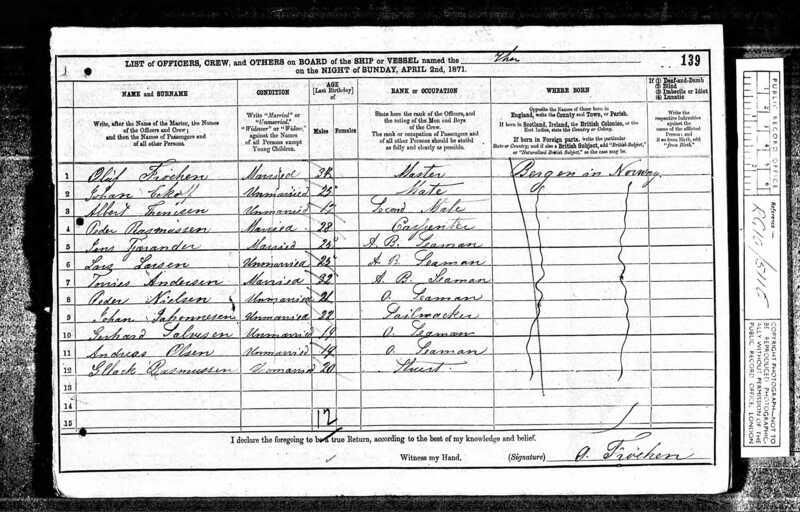 These are entries for the brothers of my great-great-grandfather Jens Rasmussen in the 1910 census of Norway. By this time the Rasmussen family had taken to using Østrem [the name of the farm they had lived on in Lindås] as the family name. They were living on Ryum farm (some family members then used the last name Ryum) on the island of Vikna, near the town of Rørvik, Norway. Next is the record for the family of Andreas Rasmussen Østrem. Andreas had passed away and his wife Martine is listed as a Widow. Three of his sons are living on the farm. A fantastic find today. This is the 1865 Census for Norway. Who knew there was such a thing? 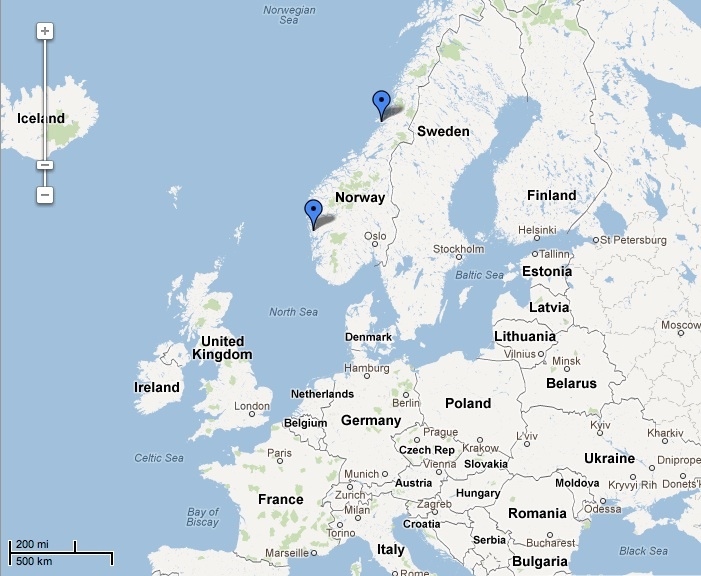 It shows the family of my great-great-grandfather Jens Rasmussen [John Hanson] living in Lindås, Hordaland, Norway. Lots of great detail here about Jens’ mother, brothers, and niece. 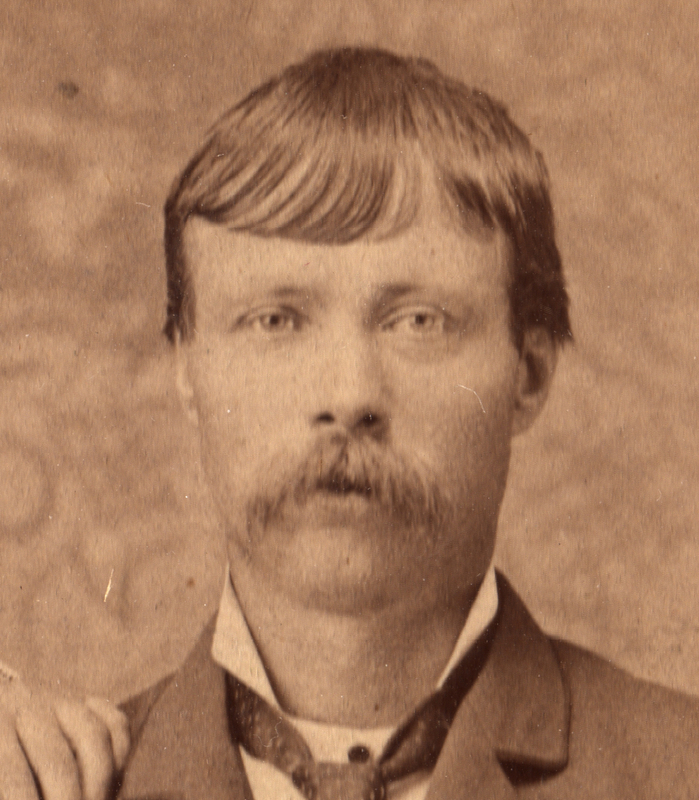 Hans Rasmussen was the eldest son of the family. He is in the census with his wife Guri and his daughter Anna. The rest of the people living with him are his brothers and sisters with the exception of Siri Andersdatter, who was their mother. Jens’ father, Rasmus Hansen, had died by 1865. As I stated in another article, it seems that Norway is getting more of its parish records online. I recently was able to find the birth and baptism record for my great-great-grandfather Jens Rasmussen, a/k/a “John Hanson”. I also found records for several siblings of the same family. 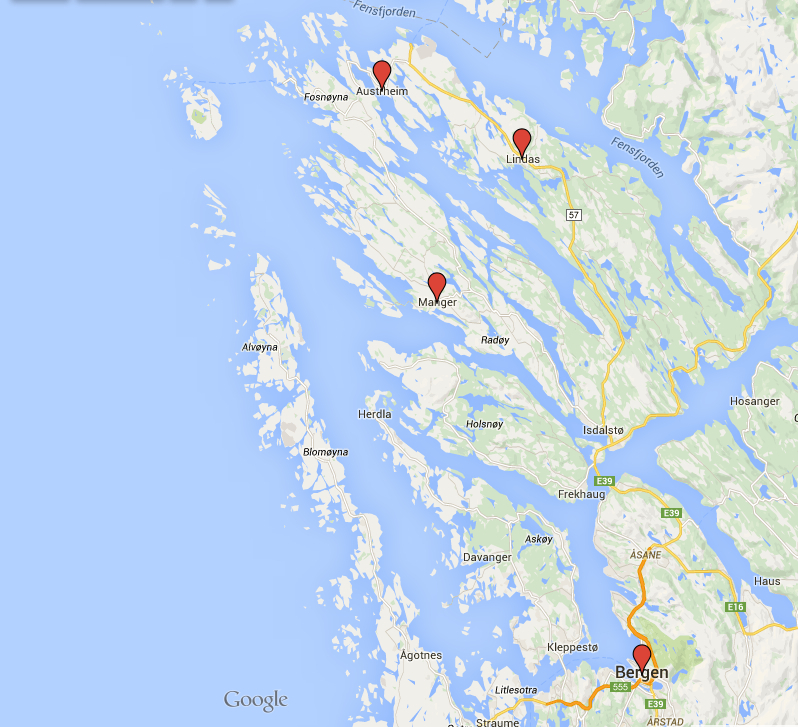 This map shows the towns mentioned in the baptism records and their proximity to Bergen. Austrheim to Manger is about 10 miles and Manger to Lindaas is about 8 miles. On July 27, 1981 my mother’s first-cousin Gloria Johnson sat down with her grandmother Olga Johanna Hanson Schmidt (1891-1990) and took notes while my great-grandmother recounted the life story of her parents (my great-great-grandparents) Jens Rasmussen (1847-1923) and Ovidia Kristine Olesdatter (1866-1956). I’m going to present the story as it came from my great-grandmother: in two parts. The first part is mostly about her father, and the second part is mostly about her mother. I’ll interject in square brackets if there are parts that need explaining or expanding in some way. First, a word about Norwegian names. Up to about 1900, it was common to use the name of the father’s first name + sen [son] for men and name of the father’s first name + datter [daughter] for women. So a son of Hans would become Hansen. A daughter of Ole would became Olesdatter. This is confusing to Americans. We’re used to the last name being invariant for men, and only changing at marriage for women. With Norwegians, it changes every generation, and siblings of different sexes have different last names. Also, just because someone has the same last name as you doesn’t imply anything about your relationship to them. It just means their father has the same first name as your father. After 1900, Norwegians often took the name of the farm they lived on as their last name. If you lived on Østrem farm you’d be Jens Østrem. 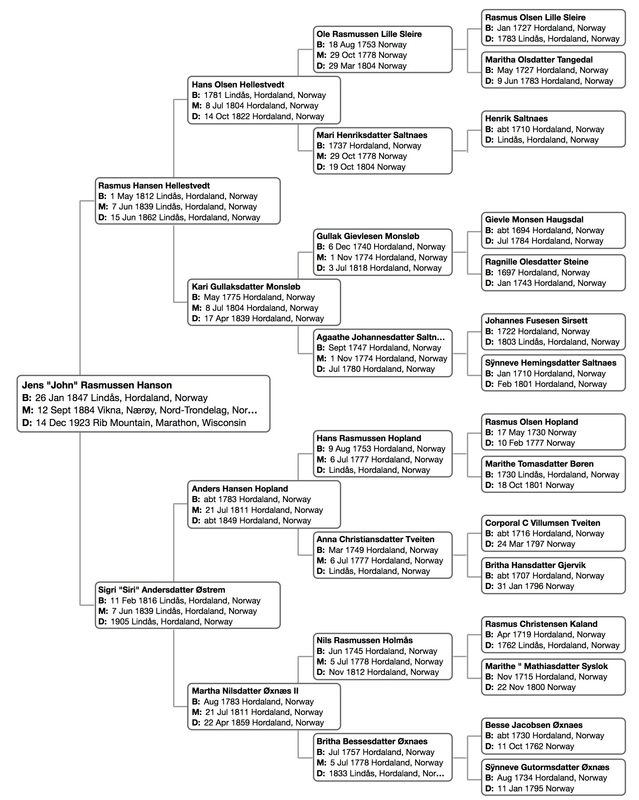 So my great-great-grandfather was actually born Jens Rasmussen, and his wife was Ovidia Kristine Olesdatter. After 1900 many of his family members took the name Østrem. Ovidia’s family took the name Ryum. In America, Jens Rasmussen took the last name “Hansen”, which was his father’s last name, and Americanized this name to “John Hanson”. His wife became Ovidia Kristine Olson. 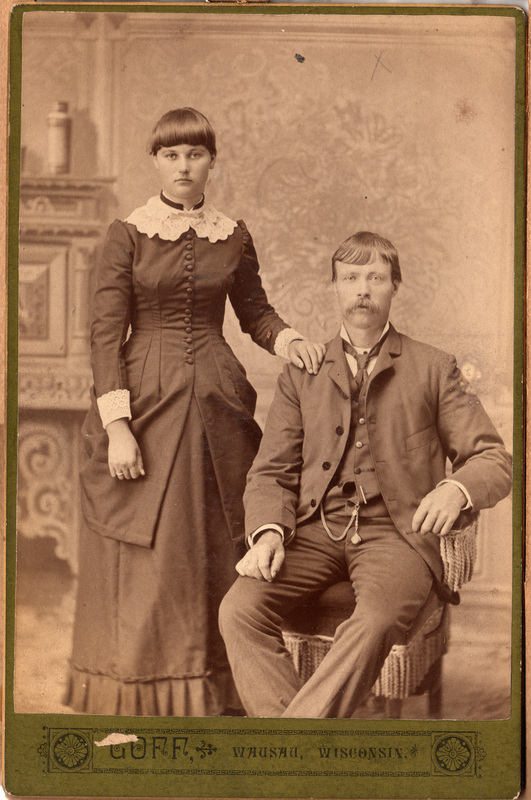 Ovidia Olson and Jens Hanson around the time of their arrival in the US, about 1885. She was 18, he was 37. Map showing Rørvik (northern marker), birthplace of Ovidia Olesdatter, and Lindås (southern marker), birthplace of Jens Rasmussen. As a teenager, Jens worked as a seaman, first on smaller boats that carried freight from village to village, then on the large three-masted schooners which traveled the open ocean. One of his most interesting trips was to go to Peking, China to bring home a load of rice. A round trip took three years. It started out from Portugal, with loads of bananas, trading from city to city. Then proceeded down the west coast of Africa and around Cape Good Hope, up the East coast of Africa to Calcutta, India. He did not like some of the poverty and sights he saw there. When they reached Peking they loaded the ship with rice. Dad explained much of the trip to his grandson, Edwin Jr. [Edwin Friedrich Schmidt Jr (1914-2002)], when Edwin was about three or four years old. He told him “it took three Chinamen to lift a bag of rice!”. Many of these stories stayed with Edwin and gave him an appreciation for the life of adventure – especially sailing. On the way home along the east coast of Africa the pirates would often rob the ships, so they stayed close to the mainland. When they were near Cape Good Hope they spotted two pirate ships and they pulled into Cape Good Hope to stay a few days until the pirates left. It was just a very small village at the time. Then they went up the African coast back to Norway. Another trip he talked about was going around Cape Horn. He mentioned Buenos Aires, Montevideo and Valparaiso and the Golden Gate, (Norwegian – Gul Gata), the first name of San Francisco. He always said he crossed the Atlantic seven times. My father’s last trip as a sailor was when they stopped in New Orleans. There they heard about the timber up in the northern part of the US. So, as he said, he and a friend “jumped ship” and got a job on a river boat up the Mississippi River to Prairie du Chien, then got up the Wisconsin River to Portage, to Stevens Point, and up to Wausau, arriving in Wausau the year after the railroad came in, about 1872. Walter Alexander Stewart, owner of the sawmill business, owned a forty acre plot of land right across from where the Grandfather Falls is today. Dad’s first job was to clear an acre of that land. When winter came, dad was in charge of the logging camp as cook. He also had a “cookie” [an assistant] to do chores and help the lumberjacks. In summer, he cooked in the boarding house for the sawmill crew. The boarding house stood where the Post Office is now [in Wausau]. The west side of Wausau and all of Marathon County were woods. While he “had his job in his pocket”, he thought he’d better go to Norway and get married. So he did. His girlfriend lived in Bergen, as did his mother. But, rather than go to Bergen directly, he first decided to go visit his three brothers who lived north in Rørvik [Rasmus, Andreas, & Hans]. One day he was sent over to the farm of the big landowner, Gundbjørne, to borrow an item. He saw Ovidia Hanson there but they did not get to talk. Later, when he brought back the borrowed item, he did talk to her and she invited him to a harvest party. He accepted the invitation, and three weeks later they were married and on their way to America! Rasmussen / Olesdatter marriage record, 12 Sept 1884, Vikna, Nærøy, Nord-Trondelag, Norway. Jens Rasmussen & Ovidia Olesdatter during a visit to Bergen, Norway in October, 1884. They left for America shortly after. While crossing the North Sea, they stopped at Seaport Hull, Scotland [Hull, Great Britain on England’s East coast]. Ovidia had never seen such a sight as she saw there. There were rugged coasts, rocky ledges and people old and young moving around. The people had long hair and ragged clothes. It took about two good weeks to cross the ocean. Ovidia was sea sick all the way over. She was proud to say she walked across the Brooklyn Bridge [completed in 1883] – there was so much to see. Dad would just keep walking, bachelor that he was. All at once the bridge started to raise up. She was so frightened when she saw it open – she just jumped and made it! In Wausau they must have stayed with a friend until time for dad to go to the logging camp. Mother had her board and room at that camp. The walls of her room were wall-papered with English language newspapers. She said she stood day after day and studied, and before long she could read English. They spent four years on that job – four summers cooking for the sawmill crew and four winters in the logging camps cooking for the lumberjacks. During those years, a baby boy was born and lived for eighteen months [Roger Hanson 1887-1888]. he died of a fever. It was a sad and lonely time for mother during those years. The Walter Alexander’s had a pair of twin girls that died of diphtheria. Mother said she spent some time with Mrs. Alexander. At that time they had saved money enough to buy four forty-acre plots of land on the west side of Mosinee Hill. Their first housekeeping was upstairs in the Ole Wick House on the corner of 1st Street and Fulton Street in Wausau. Later they moved to live on the land. A house had been built by a homesteader. He had left. The house was on a very good foundation with a good cellar. Later an addition was built on. Dad hired out to cook for a camp in Rhinelander, so mother went to live with a family named Larson who were friends. In mid-February she was six months pregnant. The weather was warm and dad sent for her to come up to Rhinelander for a while at the logging camp. She thought it was a good idea, and there was a freight train running between Rhinelander and Wausau. She took her dog, Billy, a revolver, and a big homespun shawl with her. She got on the train heading toward the camp in northern Wisconsin. Early the next morning, around 5:00am, the train stopped and left her off. She got down in the darkness, the train went on, and she stood there getting her bearings. Luckily, it was a moonlit night. All she saw was a large pile of railroad ties, and she quickly realized she had been let off in the wrong spot; this was not her destination at all! She could hear wolves howling in the darkness nearby, and Billy was wild with fright. She climbed up on the piles of ties and Billy climbed up also. He did a lot of barking. She often got down to walk to keep warm. It must have been almost two hours later when she heard a train whistle blow. She got down onto the track and waved her shawl. The train picked her up and in a very short time she was at the station. Dad picked her up and on they went to the camp. Later, when the snow was gone, they returned home to Wausau. Then problems developed. My birthday was to be the end of May. 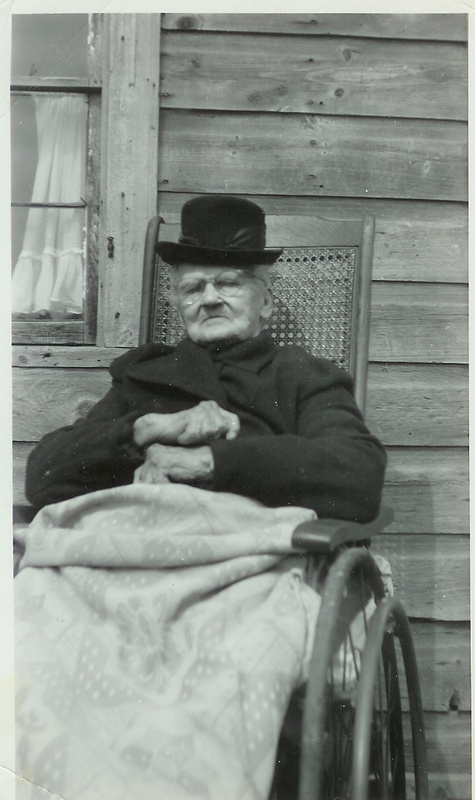 Instead I was born March 25, 1891, two months premature. I had no toenails or fingernails. I was wrapped in a wool bat and bathed in oil for six weeks. My father sued the railroad. The trial was held in Rhinelander when I was two years old. A Wausau lawyer, Neil Brown, won the case, and Dad received some money. When I was born, our neighbors by the name of Gross lived in a log house across the forty. They were grandparents of Leonard Wolf, Town of Weston. Dad had Mrs. Gross stay with mother while he went for the doctor. Mr. Gross came along since Mrs. was there. He delivered me. Later, when I was two years old, father was hired to cook for a log drive which started early in spring as soon as the ice was out of the river. They started up in Merrill (then known as Jenny), and Tomahawk. The entire river was open then. Logs were floated down to Prairie du Chien to go down the Mississippi. Mother said she sat up all night. The Mat Rhyners (brother to Robert Rhyner, Louis’s father), lived across the forty from where the Gross family lived. Mat Rhyner was a teamster – he hauled logs to Wausau. His light would go on at four o’clock in the morning. Then mother and I, knowing that daylight had arrived, would go to bed. The dark nights were long when she was alone in such wilderness. Many of the men who were woodsmen were out of work during the summer, so they hired out to the people that were starting farms – clearing land, blasting out stumps, etc. Dad had plenty of help clearing one forty for building. Dad generally had two men helping him to cut hay and to cradle grain. Hay was cut by hand and raked by hand and piled in heaps to dry. I can remember carrying water down for them to drink mid-morning and mid-afternoon. Then came potato fields. Potatoes were dug. My brother John Hanson and I came home after recess to pick potatoes. 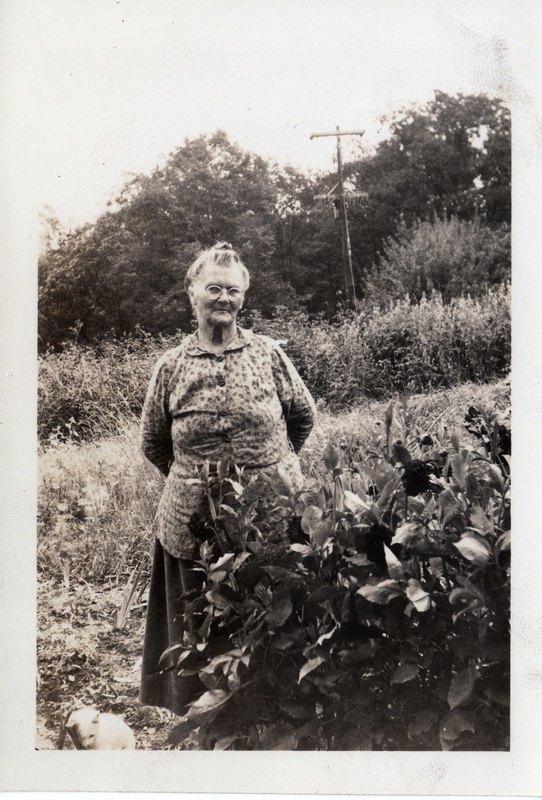 Ovidia Hanson in her garden, about 1942. I clearly remember the first cream separator – the LaValle. It separated the cream from the milk. The milk was used for the calves, and the cream for butter. There were generally five or six calves. Then came the hay mower and the hay rake. Later, corn was raised rather than wheat and oats. Then, of course, came silos. Next were added purebred Gurnsey cattle. Their milk has a high percent of butterfat. There were four herds of Gurnseys in the neighborhood – the Hanson’s, Thomson’s, Bandy’s, and the Beans’s. Soon a neighbor came across the forty – named Wright. They had purebred Holsteins. Everybody in the county went to Holsteins. They had perfect milk for cheese-making. The milk was hauled to the cheese factory in Marathon City by truck. Dad and mother had five children: Roger Hanson ( who died at the age of 18 months), Olga Johanna Hanson (Schmidt), John Albert Hanson, Mabel Esther Hanson (Hummel), and Roy Sigvard Hanson. We were all at the farm until we married except for John who went to college. Roy continued to farm. My sister, Mabel, married and settled in the Town of Weston. I married and settled also in the Town of Weston, until later it became Rothschild. Ovida Olson, John A. Hanson (standing) Jens Hanson (l to r). 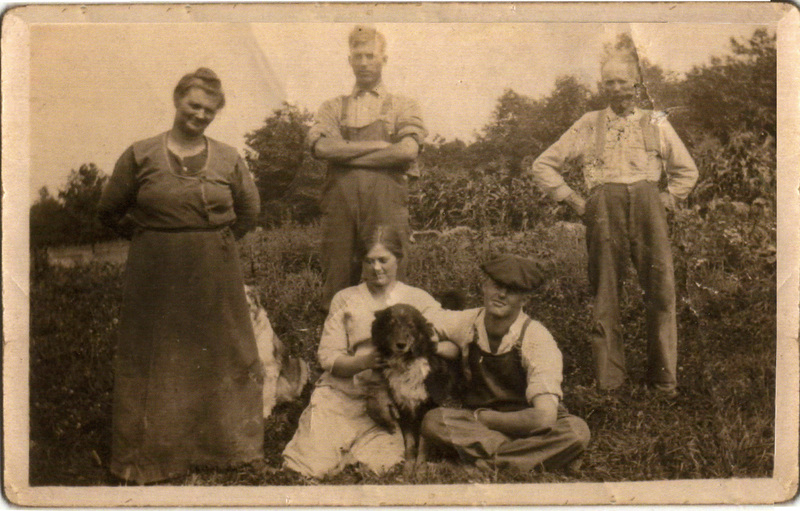 Mabel Hanson, Roy Hanson (seated), on the family farm about 1921. Being the oldest in the family, I was the one who had the most responsibility. The folks had to drive to Wausau at times. But mother really did all the business and delivered butter, cream, etc. to customers. Once, Roy had surgery in Merrill. Mother had to stay in Merrill for two weeks. Dad had hired a man to work in the woods. Of the three other forties, two especially were well-stocked with timber. I was thirteen years old. I did the cooking and took care of the butter-making with the help of brother John. One day the butter was churned and washed and worked. There was twenty-five pounds of butter. It was weighed and one ounce of salt had to be added to each pound. I waited until supper was over and then we were ready to salt the butter and form it into pounds. Dad always bought one hundred pounds of sugar and one hundred pounds of salt in the fall. I sent John upstairs to weigh twenty-five ounces of salt. Well, we worked it in and I happened to taste it, and it was sweet! I nearly died! How terrible! I finally got back to normal, so I said to John, “you go up and weigh twenty-five ounces of salt.” He did and we worked and worked to get all of the whey out and put the butter in pounds. The butter was delivered to customers. I told mother when she got home. So, the next trip to Wausau with butter she asked a couple of customers how the butter had been the week before. They replied that it was the “best they ever had!” That and many other times did I have problems with my help. I, for one, loved the animals and everything on the farm – the beautiful woods, the wildflowers, the wild strawberries, the wonderful blackberry patches, and raspberry patches. Many of dad and mother’s Norwegian friends came out on bicycles to pick berries. My father, born and raised with European ideals, worshipped the trees and the good soil. On a rainy day father would go down into the trees and thoroughly enjoy working in the woods. He died the year that Olga’s daughter, Norma, was born, December, 1923, of angina. He was seventy-seven years old. Mother lived for many years after dad’s death on the farm. Roy worked the farm, and with Clara, raised his family. Mother developed circulatory problems and eventually one leg had to be amputated. She lived to the age of ninety, and died in August of 1956. 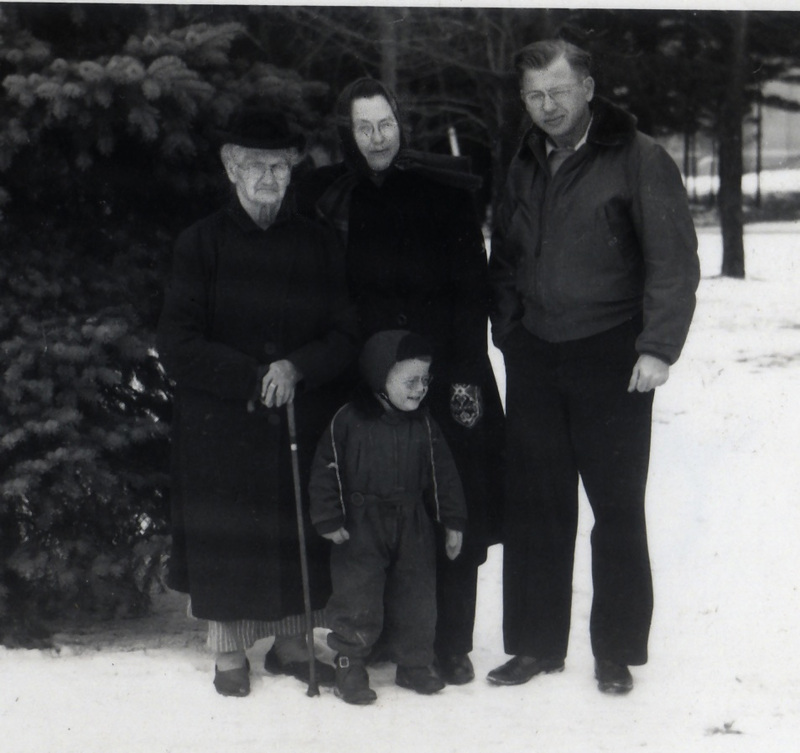 Four Generations: Ovidia Olson Hanson, Olga Hanson Schmidt, Edwin Schmidt Jr. and Edwin Schmidt III taken about 1948. Ovidia Hanson, about 1956, shortly before her death.